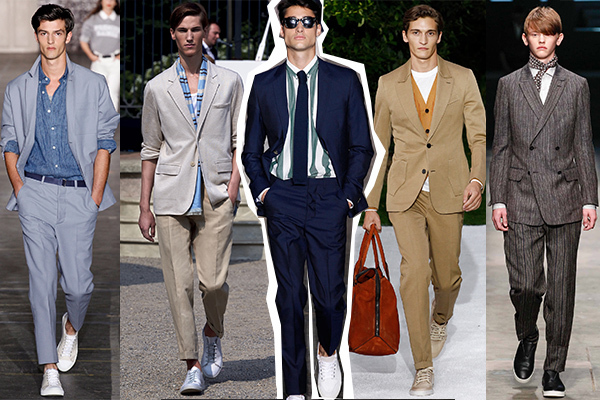 Giving a break to the sea of samey suit-and-tie looks, menswear takes a contemporary route to spruce it up. Seen everywhere from Giorgio Armani to Z Zegna, the sneaker emerges as a perfect match to the suit, as more and more men swap their oxfords and brogues with this sporty counterpart. Cater to the new look of the season by blending sport-chic and luxe-formals through a structured blazer atop a pair of streamlined trousers and top it off with the finest or the funkiest pair of sneakers you have. Add oomph with a contrast buttoned-down shirt that delivers a certain relaxed character to your look. Just make sure that the cuff or the topline of your trainers end at the ankle. After all, the devil is in the detail. Scroll through to find the perfect picks for your wardrobe.